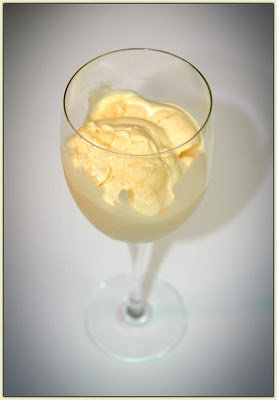 Discription:Apricot Ice Cream, a happy result of the water-sodium chloride eutectic. Pit the apricots and slice them up. Put the sliced apricots in a saucepan with the 4½ tbsp water and simmer until soft, 30-45 minutes. The water is there to prevent the fruit from sticking until it gets hot enough to release its juices. Dump the apricots into a food processor, blender, or food mill, and purée thoroughly. Press the purée through a sieve and set aside. In a non-reactive saucepan or double boiler, add the sugar to the cream. Heat on low heat and stir until the sugar is dissolved completely. In a large bowl, whisk the egg yolks to mix and then gradually whisk in the warm cream. Put the egg-sugar-cream mixture back in the saucepan or double boiler and cook until the mixture coats a spoon. Take the custard off the heat and whisk in the apricot purée. Add about a teaspoon of vanilla extract, more or less, to taste, along with about a tablespoon of kirsch. Now put the mixture in the fridge for a couple of hours and chill thoroughly. Time to get out that ice cream freezer again. Freeze the mixture according to the directions that came with your freezer...directions that will, like as not, involve the use of ice and salt. Now taste...and smile. That’s an ice cream you won’t ever see in any stoopidmarket: perfumed with the delicate flavor of one of the summer’s most subtle fruits. Don’t forget to lick the dasher!